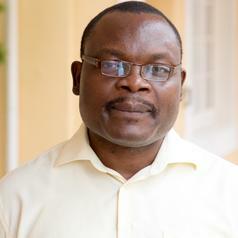 Wilfred Ndifon is an IDRC-funded Career Development Research Chair with joint appointments at both the South African and the Ghanaian centres of the African Institute for Mathematical Sciences. He is also affiliated to the department of Mathematical Sciences at Stellenbosch University. He holds Master's and PhD degrees from Princeton, and has experience in developing technologies for designing vaccines and for monitoring certain molecular sensors (called T-cell receptors) that help to protect individuals against diseases. His current research integrates concepts from different disciplines – biology, mathematics, computer science, physics – to further the understanding of fundamental aspects of adaptive immunity, with a view towards devising new ways to predict, prevent, and treat both communicable and non-communicable diseases.